If you're suffering from some type of issue with your automatic garage door, give our team a call. We have over two decades' worth of experience repairing and installing these complex systems, and there's no problem or task that we can't handle. The track that guides your garage door's movement is incredibly important, as without it the panels could collapse. If it becomes blocked by debris, or develops some bends, it could cause your door to get stuck. Our technicians can remove any accumulated blockages and straighten out any dents, thus effectively restoring your system's operation in virtually no time at all. We can also perform track realignment to make sure your door doesn't get off balance. The springs are in charge of supporting the weight of your garage door. When they break, they can cause the panels to collapse, and can even seriously injure any person that's standing nearby. Taking care of them can be dangerous, and therefore any replacement procedure must be conducted by professional technicians. Our team can do this for you quickly and efficiently. We don't just repair garage doors, we install them too. We have a wide variety of garage doors for you to choose from, and our experts can help you find the perfect match for your home. From highly insulating and gorgeous wooden models, to durable and fortified steel doors, the choices are plentiful and diverse. We've been helping local homeowners with various garage door problems for a very long time now, and our professional technicians have practically "seen it all" and done it too. 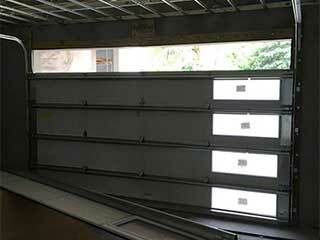 Garage Door Repair Scarsdale is your number one choice for effective and affordable services. Call us today.